William Aubrey "Bill" Harris (1937-2017) was a local Outer Banks historian and genealogist particularly interested in the history of Kitty Hawk, the Wright Brothers' first flight, and oral history. The Bill Harris papers, circa 1870s-2016 and undated, contains administrative records, correspondence, oral histories, annual reports, programs, newspaper clippings, brochures, maps, newsletters, minutes, and photographs. Included in the collection are materials relating to Dare County, the Wright Brothers, the First Flight Society, local genealogy, local church history, and the United States Life-Saving and Coast Guard services. The first three series are arranged chronologically, with undated folders arranged alphabetically at the end of the series. The Lifesaving and Coast Guard Stations series is arranged alphabetically. Original order has been retained for the final two series. Original folder titles and organization have been retained when possible. Processed by Taylor Wolford, OBHC intern, July 2018. William Aubrey "Bill" Harris (1937-2017), was born in 1937 in Kitty Hawk Village, North Carolina. He was the son of Aubrey Alonzo Harris (1913-1975) and Edna Baum Harris (1911-1996), and the grandson of Elijah Baum (1885-1965). After graduating from Guilford College in 1958 with a degree in history, he dedicated himself to documenting Outer Banks history and recording oral histories. He worked for the Wright Brothers National Memorial in Kill Devil Hills, North Carolina as a historian before serving the National Park Service for over 38 years. As superintendent of Cape Hatteras National Seashore from 1975 to 1981, he implemented various environmental protections along the coast of the Outer Banks. As a local historian and genealogical researcher, he was an active member of numerous organizations such as the First Flight Society, The Albemarle Genealogical Society, and the Austin Cemetery Association. Additionally, he was a board member for the Outer Banks Community Foundation and Outer Banks History Center Advisory Committee, and he served as the mayor of Kitty Hawk from 2001 to 2005. He continued researching local history and recording oral histories until his death in March 2017. [Identification of item], PC.5007, Bill Harris Papers, Outer Banks History Center, Manteo, NC, U.S.A. Received from Bill Harris, September 1990, June 2001, May 2006, March 2010, and July 2016; and Judith Fearing, November 2017 and February 2018. The Bill Harris papers, circa 1870s-2016 and undated, contains administrative records, correspondence, oral histories, annual reports, programs, newspaper clippings, brochures, maps, newsletters, minutes, and photographs. Included in the collection are materials relating to Dare County, the Wright Brothers, the First Flight Society, local genealogy, local church history, and the United States Life-Saving and Coast Guard services. The collection is arranged into six series: Dare County, 1936-2014 and undated; Wright Brothers' First Flight, 1905-2016 and undated; Local Genealogy, 1882-2016 and undated; Lifesaving and Coast Guard Stations, 1873-2010s and undated; Bill Harris's Oral History Project and Audiovisual Materials, 1960-2012 and undated; and Photographs, circa 1870s-2003. The Wright Brothers' First Flight Series, 1905-2016 and undated, contains materials related to the first successful heavier-than-air powered flight made by Orville and Wilbur Wright in 1903, including documentation of various anniversaries and commemorations of the event. The series includes historical publications, programs, photographs, invitations, correspondence, and clippings related to the Wright Brothers and their historic flight, as well as papers related to the Wright Brothers National Memorial in Kill Devil Hills, North Carolina, and material on aviation history. Included in this series are a number of records and papers related to the First Flight Society, of which Harris was a member for many years. The Local Genealogy Series, 1882-2016 and undated, contains family histories, genealogical data, family trees, clippings, and correspondence related to various families inhabiting the Kitty Hawk and greater Outer Banks area. Many materials relate to members of Harris's own family, as well as the Baum, Wescott, Midgett, and other local families. Also included are a number of files relate to local churches and cemeteries, as well as extensive genealogical correspondence with Annie Lee Wightman. The Lifesaving and Coast Guard Stations Series, 1862-2010s and undated, contains reproductions of wreck reports and other official records, clippings, correspondence, historical sketches, and photographs related to the U.S. Lifesaving Service, U.S. Lighthouse Service, and U.S. Coast Guard, primarily in the Outer Banks area. Nearly all the materials in this series are photocopies of original documents held at other repositories, and in most cases, the date range of the folder indicates the creation dates of the original document(s). No original station records are included. Rarely, original photographs of the various stations described in this series are included. The materials in this series primarily relate to Bill Harris's oral history project, completed over the course of several decades (1960s-2000s). This series includes recordings of oral history interviews conducted by Harris with local residents of Kitty Hawk and the Outer Banks, as well as Harris's notes on the interviews and an index created by Harris indicating major topics covered by the project. Also included are three 3.5" floppy disks containing National Park Service photographs (1999), a DVD entitled "Hyde County and the Baum 45th Reunion" (2012), and a VHS tape entitled "Cape Lookout: A Diamond in the Rough with Gary Dean." Interview conducted at the home of Mr. Harris and covers his career with the Park Service, Kitty Hawk History, and Harris's work interviewing older residents of Kitty Hawk, both as a college student and then years later. The Photographs series, circa 1870s-2003, contains photographic prints, slides, film negatives, tintypes, cabinet cards, and cartes de visite collected by Bill from various local families. Many of the photographs are originals, but some are reproductions printed on photo paper or copy paper. Photographs primarily consist of candid and posed portraits of various family members and groups, as well as images of automobiles, houses, and a few local events. Most of the people in the portraits are identified, but many individuals in candid shots are unidentified. The photographs primarily relate to the Baum, Harris, Sawyer, Tillett, and Wescott families. The Dare County Series, 1936-2014 and undated, contains papers related to the history of Dare County, North Carolina. 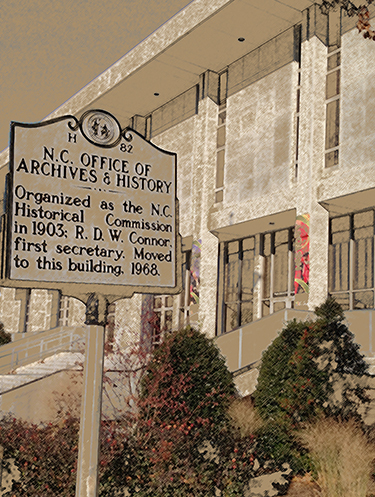 The series includes subject files, brochures, yearbooks, newspapers and news clippings, maps, and other documents comprising Harris's research on various topics in Dare County's history. Harris was especially interested in the history of the town of Kitty Hawk, and this series includes several school yearbooks, newsletters, publications, photographs, maps, and historical sketches focusing on Kitty Hawk and its residents. Also included is significant documentation of the Outer Banks History Center and its Advisory Committee, with which Harris was involved for many years.